We make safety our priority because we want our employees to go home to their families every night. 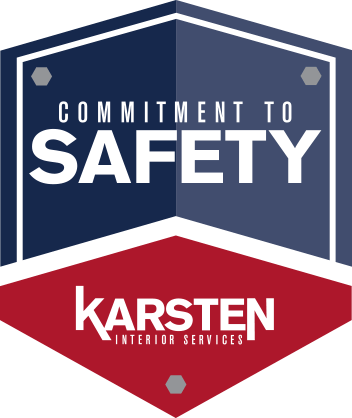 At Karsten, we believe safety is our responsibility. We demonstrate our commitment to providing a safe and healthy workplace through adherence to occupational safety and health standards. Through actions and awareness, our employees can ensure their own personal safety as well as the safety of others. It’s this on-site team accountability combined with our award-winning in-house safety programs that allows us to attain a modifier that always exceeds the standards to work on your projects. Our company is also proud to be a part of the Construction Career Collaborative (C3), which is an alliance of socially responsible owners, contractors and specialty contractors that positively address the issues facing craft workers today. Through C3, our leaders are 30-hour OSHA trained, and our field representatives are 10-hour OSHA trained. At Karsten, we make sure that safety is at the forefront of everything we do. It’s our job and first priority to ensure the safety of our employees. It’s our job to provide a safety orientation course before stepping foot on a job site. It’s our job to make safety education a priority by following guidelines set forth by OSHA and other supervising agencies. It’s our job to implement a comprehensive written safety and health program based on industry rules and regulations. It’s our job to designate safety personnel to perform daily safety audits. It’s our job to never cut corners. It’s our job to make sure our employees make it home every night.